Nah. Sorry, TaylorMade. 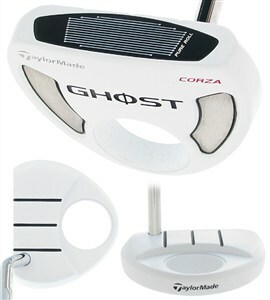 This Corzo ghost putter didn't do it for me. Now before you start to judge -- no, it's not because it is a long putter and I have some kind of fear that using a belly putter makes me look older. I happen to think the long putter is a very cool idea. While I don't use one (I actually just can't stand the thing sticking out of my bag that far), I don't discredit them. However, this putter just didn't seem to "line up" for me. The white color of the ghost really does stand out against the green grass, and the little polymer inserts really snaps the ball off nicely, but the lines and "secondary alignment" hole just threw me off. I consider myself a decent putter, and I could never really get a good stroke with it. Now this is going to sound very petty -- but I'm truly just giving my opinion. This putter look and feels "cheap," too. Believe me, I don't gauge products off looks, but this time it reinforced my negative experience with it. Conversely, the Scotty Cameron Kombi is much nicer and really draws your eyes in and allows you to take better aim in my opinion. While the TaylorMade is average in price, I found myself wishing I was using something else. Sorry TM, I love your stuff -- but not this one.